WASHINGTON, D.C. --- In a Pew Research Center survey of Seventh-day Adventists, members of the denomination have overwhelmingly pointed to Adventist retired neurosurgeon Ben Carson's political views as the most disappointing thing in Adventist history next to the Great Disappointment of October 22, 1844. "I wish he'd stuck to neurosurgery," said Nost Algia, one of the 1,000 American Seventh-day Adventist surveyed regarding the controversial US presidential campaign launched by Carson. "Dr. Carson could do no wrong back when he was separating Siamese twins and penning 'Gifted Hands,'" said Algia. "Then came all this political mumbo jumbo." Analysts say the fact that Adventists rate their disappointment with Carson's politics as being second only to the disappointment of the Millerites when Jesus did not return to earth, is highly significant. Although the crushing event took place before the Seventh-day Adventist denomination was formally founded in 1863, it has closely shaped the church's teachings. "It is, to say the very least, extremely awkward to have a politically polarizing, completely unscripted Seventh-day Adventist doing this well in the Republican polls," said Algia. "Not only does Ben Carson make very controversial statements about guns, other religions and lifestyles, but he threatens to damage our traditional Adventist position of not aligning the church with any one party." Algia stressed that Adventists are sticklers for the separation of church and state and that "we also have rather specific views about the role of the United States in these End Times. Having an Adventist presiding over the most powerful nation on earth is hardly a dream come true." Dr. Carson certainly has the right to think what he thinks and believe what he believes and participate in politics. But that doesn’t necessarily make him a good presidential candidate, or a good president. America is a country of many differences, diverse, multicultural, many religions, races, cultures, languages, rich, poor, able, disabled, liberal, progressive, conservative, socialist, and the president, whoever the president is, has to dance on that trampoline. Ben Carson pretty much just sounds like Rush Limbaugh’s parrot. Just wait ’til he gets the nomination and the journalists start probing into Adventists’ beliefs about the End Times, with the United States joining forces with the Catholic Church, the Beast of Revelation, and Pope Francis, the very popular Pope Francis, the Antichrist, to persecute Adventists and Jews because they keep the Jewish Sabbath. Gonna be a whole lotta jaw droppin’ going on. Let the jaws drop. Truth is truth. NO ONE KNOWS WHO THE ANTICHRIST IS OR WILL BE. BUT IF YOU LOOK AT THE MUSLIM WORLD, THEY HAVE A HATRED AGAINST THE JEW AND CHRISTIANS, SO CURRENTLY THEY ARE THE ANTICHRIST, AND MOST WILL ADMIT IT TOO. St Paul, you are spot on! Islam is the enemy. Look all around you… Who is that St Francis guy? 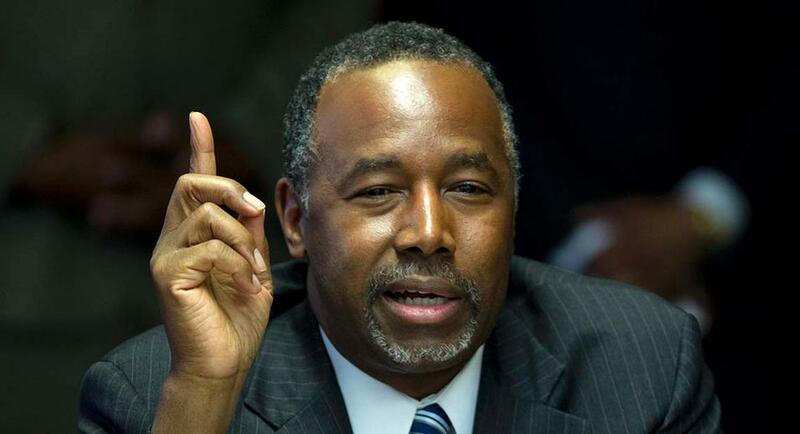 “Ben Carson pretty much just sounds like Rush Limbaugh’s parrot.” Wow! That is a perfect diagnosis. And yes, we should all expect that Dr. Carson will offer no resistance to happily becoming a Reichpublican puppet. Then you need to repent of being a war-mongering Reichpublican. Dr. Carson, the “parrot” of Limbaugh? Satire correct? If anything Limbaugh parrots what CARSON says. If you listened to Carson you would know that. You really think he sits around, listening to Limbaugh all day, THEN goes out on the campaign trail? Carson does not need to ‘parrot’ what anyone says. He is too independent in his thinking, too analytical, too thorough. His whole adult life he has found solutions that others have not been able to do, knows how to establish a winning team, and has been successful. He will do the same thing in politics. Amazing how some can mistake a calm, controlled, mentally healthy, not self indulged, dignified personality for weakness and lack of energy, just because other politicians and candidates behave as if they are on hyper drugs, scream, rant and self absorbed (hillary, definitely mentally unstable, and trump). Hey Ben, are you channeling Rodney King? IS GOD A WAR MONGERING GOD?? BY MANY ACCOUNTS IN THE OLD TESTAMENT, AND SPECIFICALLY JUDGES 3:2 HE SEEMS TO BE. I KNOW, I HAD MY ORDERS. In this case, the Florida leadership was right. They weren’t stooping low, they were reaching new heights of wisdom. The survey as such, has an extremely narrow data-base. To make blatantly conclusive statements, simply on the basis of the findings of such a survey, is a gross-distortion, a gross mis-representation of what the world-SDA membership thinks of Dr. Carson. I’m sure countless of SDA’s within and without the USA, are closely following and praying that God-willing, the Dr does get elected…. It is an insult to portray narrow minded bigots like Nost Algia as speaking for the entire American Adventist membership! Should Dr. Ben Carson be controlled? Dr. Ben Carson should be disfellowshipped immediately due to his recently announced intention to Nazify the Department of Education and his faith in the Ayn Rand-ist propaganda of the Reichpublicans. Ayn Rand-ism is a Satanic delusion. ZOG, GET UP. YOU DO UNDERSTAND THAT BEING DISFELLOWED DOES NOT CONDEMN YOU TO LOOSING SALVATION RIGHT? That’s an interesting name for the survey participant, “Nost Algia.” Quite a few may feel nostalgic about the days when one could say: “See, Adventists must be cool because Dr. Carson is one.” Now I just hope the public will not assume that all Adventists share Dr. Carson’s political views. OF COURSE NOT. BUT I WILL VOTE FOR HIM IF HE RECEIVES THE GOP NOMINATION. I’M AN SDA WORKING FOR THE FED GOV IN FOREIGN AFFAIRS. CARSON WILL DO WELL. FUNNY HOW IT’S HIS “BROTHERS AND SISTERS” ON THE ATTACK. ANYWAY, SALVATION IS NOT DENOMINATIONAL, SO BEING SDA IS NOT A REQUIREMENT. P.S. A MAN I KNOW TOLD ME A WEEK OR SO AGO THAT HE IS NOW INTERESTED IN THE SDA CHURCH, WHAT GOT HIM INTERESTED? BEN CARSON, LOVES THE GUY. I TOLD HIM NOT TO BECOME AN SDA JUST FOR THAT, HE IS A NON PRACTICING CATHOLIC, AND A HIPPIE. I am a practicing Catholic and non-hippie. I’M A HIPPIE AND NON PRACTICING CATHOLIC. GO FIGURE. I this article is wrong, then I don’t want to be right. HI HILARY, I DELETED YOUR LAST EMAIL, CAN YOU SEND AGAIN PLEASE. Sorry, Stu. I can’t resend the e-mail; I had to take down my illegal private e-mail server due to criticism from the “vast right-wing conspiracy.” Anyhow, if this article is wrong, then I don’t wanna be right! First of all, “WASHINGTON, D.C. — In a Pew Research Center survey of Seventh-day Adventists, members of the denomination have overwhelmingly pointed to Adventist retired neurosurgeon Ben Carson’s political views as the most disappointing thing in Adventist history next to the Great Disappointment of October 22, 1844.” Is “overwhelming” a number or percentage? I don’t see a reference for this “overwhelmingly” scientific and real Pew survey. When I looked myself I couldn’t find one. There is a little saying on the Internet. Pics or it didn’t happen. In this case, it’s references or it didn’t happen. It’s so laughable that someone would post this while obviously showing they have a differing political view than that of Mr, Carson. I almost think this is a troll, as I said it is laughable…. Just not funny enough to be a troll. This person is just a liar. Liar. Of course you couldn’t find the data- this is a satire site! The data was all fabricated- it’s a joke (though maybe way too close to the truth for comfort!). Right on both counts – this is a satire / joke site, but it’s also too close to the truth to be funny. CAREFUL WHEN YOU STOOP LOW, LOTS CAN HAPPEN. SOME GOOD AND SOME NOT SO GOOD. Then is the article true when it says that the church does not want to be seen as aligning itself with any one political party or another? And is the article also true as saying that he makes controversial statements about guns, and other religions; and that the Church has specific view about the role the United States plays in these “end times”? If so, then I would say that it is fairly accurate and that while it is his “right” to pursue his candidacy for the Presidency of the United States, it is also a very slippery slope he treads as a member in good standing or should I say, the Church is on slippery ground. It can stand to gain positive and also negatively from his run. This is obviously not an authentic pole or commentary. Satire…yes. To reference the words of only one person in the poll is rather silly. And to convey the person’s name as Nost Algia is to confirm to anybody with half a brain that this is satire. The purpose of the satire seems to point to the narrowness of most Adventists. It would not surprise me that the author of this piece is actually in support of Dr. Ben Carson. With the end time scenario in mind, it may well be that both God and Satan have their targets on Ben Carson. God could actually use this man to bring about both God-centered awareness and good. Issues of spiritual proportion could actually be better defined in the context of a Carson presidency. Satan may in fact desire a Carson presidency as well but with entirely different purposes in mind. Satan’s objective would be to defeat Carson and to bring further mockery and distain on Christians. I would suggest we think a bit more broadly as Christians, and even more broadly as Seventh-day Adventists. Well, it ain’t gonna happen. And it’s not a matter of the devil being against him. He has exhibited a propensity for making silly off-the-wall comments. He’s a great doctor; he would not be a great president. Just ain’t qualified for such a high government leadership position. AS LONG AS HE SHOWS UP FOR ORIENTATION, HE’LL BE FINE, I MEAN LOOK AT BARAK. I HATE IT WHEN GOD USES ME FOR HIS OWN PURPOSE, MAKES ME FEEL CHEAP, TRASHY AND LOW, LIKE I’M SOME KIND OF A LOSER. I am an Adventist but I will not be voting for this man. I heard Dr. Carson give the commencement address at a Loma Linda graduation about 15 years ago and the whole commencement speech was about how doctors were being robbed by the Medicare system and how the horrible government was going to collapse the medical system. Yes, we all feel sorry for all the poor doctors out there. Funny, this was when “W” and the Republicans were running things. A year later when my daughter graduated from University of Illinois, a “secular” medical school in Chicago, the commencement speaker spent the entire address talking about how these new doctor should look at helping all of the people who have been left without medical care. His whole talk was about “giving back”. It was an eye opener. An SDA medical school vs. a secular university with an exactly opposite response of what you would think God would want these new doctors to hear. I know this is a satirical site, but this man is not a Christian that I could support. Not to mention his proposal to arm Kindergarten teachers, which is ludicrous. I could go on…but I won’t. If you have the transcript or can find it, please share it. I find it hard to believe that Dr. Carson solely focused on Medicare reimbursement and government spending on healthcare. Sure Brad, I have the transcript right here… I guess I must have misplaced it… are you kidding? I am imparting my impressions. I have no desire or need to quote chapter and verse to you. I don’t care if you don’t believe it. Vote for him if you like, it’s your right. But, don’t expect me to. I dislike anyone who thinks they are entitled and greedy. Actually, I think Dr. Carson philanthropy is self-evident. He and his wife have set up the Carson Foundation for helping kids meet their educational goals. I would bet (I have no concrete evidence) that since he speaks of tithing as a model for taxation that he actually does tithe himself. Regarding Medicare reimbursement, everyone desires and desires to be rewarded for their work. Medicare is notorious for continuously lowering reimbursements. What is Medicare does pay today is a tiny fraction of what it has in the past. Yet, medical training only is getting longer and more expensive. So, yeah, since Medicare patients, by percentage, typically make up a good portion of physician’s practices, it is relevant to address this topic for at a commencement for young, fledgling physicians. I think your assessment of Dr. Carson, the person, is unfair. But, like you said, it’s your right to voice your opinion and cast your ballot as you please. I HAVE A COPY OF THE TRANSCRIPT IN MY SERVER, OOPS I MEAN HAD, AH, WHAT SERVER? Even kindergarten teachers should be armed and take baths. Agree. Armed guards at every school. Although I would prefer professionally trained police/military, a teacher that is trained will suffice. The important thing is that schools are no longer “gun-free zones”. The advertised invitation to kill our kids while away from the protection of parents in an environment essentially devoid from any resistance must end. Your shared reference is much too long for me (and I suspect others) to wade through. Please direct me to the portion which supports your statement. Actually, that is even longer as it includes a link to your previous (long) post as well as a bunch of other people spewing disgust and negativity with Carson. I have chosen to not spend the time. But thanks for sharing. It will be news eventually. Being selfish is part of your humanity, that is why I use it to my advantage. YOUR JUST JEALOUS DOG I MEAN ZOG. Evil prevails when Good men do nothing. So.. If you were in Ben Carsons shoes… what do you do? What do you do? A) He retires and get labelled limp wimp like so many many many other adventist. B) Decides to be a mover and shaker and shape the world as best you can. Which is the true Gospel… to be a light to the world. Not sit on your hands and bleet on about “Prophecy.. it is meant to be this way or that way..” Prophecy will fulfill no doubt but we are not to use it to excuse ourselves from duty. It seems some adventists regret having their bubble popped concerning THEIR SPIN on end time events. Ben is a great man. A smart man. An incredible surgeon. But he’s been saying some off-the-wall comments that sound silly. He just doesn’t sound knowledgeable enough about government to be a president. Of the “silly” things he said, the majority are because the media plays edited snippets. Yes, there may have been some missteps, but he is not a “polished politician”. That is the exact reason his support is growing. Doing away with political correctness and being honest. Saying things that are true, despite making some groups uneasy or even upset. HAS THERE EVER BEEN A POLITICIAN WHO NEVER SAID ANYTHING OFF THE WALL? IT IS EVEN A GREATER AND BIGGER DISAPPOINTMENT THAT ANY INFORMED SEVENTH DAY ADVENTIST SHOULD EVEN ENTERTAIN THE THOUGHT THAT BENS’ BID FOR THE US PRESIDENCY SHOULD OR COULD BE COMPARED WITH THE GREAT DISAPPOINTMENT OF 22/10/1844.THAT TRAGEDY CAME AS A RESULT OF A MISAPPLICATION OF SOME VERSES OF THE BIBLE BY A SINGLE MAN WHO WAS REGARDED AS A PROPHET OF GOD.1) BEN IS NOT THE PRESIDENT,THE PRESENT PROPHET OR EVEN AN ORDAINED PASTOR OF THE SDA CHURCH.2) BEN IS A BLACK MAN MAKING A BID FOR THE JOB AND HE IS NOT THE PRESIDENT,OR EVEN ELECTED TO BE ONE.3) WHAT ARE HIS MOTIVES AND WILL HE BE ABLE TO MAKE A BETTER AMERICA, SHOULD BE THE PRIME CONSIDERATIONS. FOR THOSE WHO ARE DISAPPOINTED ABOUT BENS BID FOR US PRESIDENCY, IT WOULD BE WORTHWHILE TO STATE IF HE IS GOING CONTRARY TO 1]’THUS SAITH THE LORD’ 2]’THUS SAITH THE CHURCH’ OR 3]THUS SAITH BENS’ CONSCIENCE. Well, Ben campaigns on Sabbath. He regularly participates in political events and gives stump speeches on Sabbath. Apparently that is not against his conscience. THANKS FOR THAT INFORMATION. THAT BEING SO HE STARTED TO VIOLATE THE FUNDAMENTALS OF HIS FAITH AND IF HE DOES NOT STOP OR HAVE AVERY GOOD EXPLANATION HE WILL GO DEEPER AND DEEPER IN DISOBEDIENCE. DID ANYONE PERSONALLY ON THAT MATTER. MY PASTOR WORKS EVERY SABBATH, HAS MEETINGS ETC. GOOD THING HE IS NOT UNDER THE LAW. Well, selling your own books for commercial profit and doing political campaigning on Sabbath is a bit different from preaching the Gospel and performing Communion on Sabbath. Ben Carson ain’t no preacher, although CNN recently reported that he is a “former Sunday School teacher.” The point is: he claims to keep the Sabbath holy; yet, when he decided to run for president and saw that Sabbath is the best day for campaigning, he suddenly decided that he’s exempt from it. He also says that he attends Sunday-keeping churches as often as the Adventist Church and does not really consider himself an Adventist, but rather just an “American who happens to believe in Christ.” So all the misguided Adventists who will blindly vote for him just because he’s supposedly an Adventist, are blind. If this guy wins, they will be in for a surprise. Maybe he is not a Sabbatarian. I AGREE. BESIDES, HE IS A MAN WHO HAS ACCEPTED JESUS AS HIS SAVIOR. SAUL WAS THE FIRST KING OF ISRAEL, ANOINTED AND ALL, THAT DID NOT GO WELL. BEN IS RESPONSIBLE FOR HIMSELF AND WHAT HE DOES.WE DO NOT KNOW WHAT IS GOING ON IN BENS’ HEAD.WE ARE LEFT WITH OUR DUTY OF OBEYING THE LAWS AND REAP THE RESULTS IN OUR LIVES. SO TRUE. WELL SAID LEVI. HOW’S YOUR HORSE AND BUGGY? THE “GREAT DISAPPOINTMENT” WAS THE FRUIT OF UPPITY, SELF RIGHTEOUS FALSE LEADERS AND PROPHETS CLAIMING TO “KNOW” THE WILL AND PLANS OF GOD. Really? I thought it was a Baptist preacher (William Miller) who really was an earnest, independent, Bible student, who really didn’t want to preach. But what he discovered in time prophesy was so compelling and about to happen in his generation, he started to share what he had found. BTW, there were others, besides Miller, who simultaneously made these time prophesy links and believed the return of the Lord during that same time period. The Bibles and texts hadn’t changed for hundreds of years, yet multiple people came, independently, to the same conclusion on different continents at nearly the same time. Coincidence? Or divine intervention with eventual revelation? I believe the latter. The “prophet” you referenced, came AFTER Baptist preacher Miller (and others) misunderstanding of the time prophecies. The date came and went without Christ’s return (The Great Disappointment). Ellen White was a Methodist “Millerite” and did anticipate Christ’s return on the date set by Miller. She was also disappointed like the others. But she was not called to be a prophet until a short time AFTER this event. Honest people, honestly pouring over their Bible and coming to honestly held interpretations which proven to be wrong. “Uppity, self-righteous leaders”? I think, Rabbi, you are waaaaayy off on that claim. You need to read the history and background of the individuals involved before arriving at such a strongly worded description of them. “Claiming to know the will and plans of God”. They read their Bible and the dates pointed to some event. So, yeah, they used the primary source God has given us to understand His will and plans. What’s wrong with that? God rewards people who earnestly, faithfully seek His truths. And ultimately, these people were rewarded by God giving the spirit of prophesy to Ellen G White whereby the events on the date of the Great Disappointment were made clear. AN EVEN GREATER DISAPPOINTMENT IS THE FACT THAT 170 PLUS YEARS LATER WE STILL FALL FOR IT. SAD. Who is falling for what? Your comments are terse for a reason. They lack of substance. “We still fall for it…”. I am going to assume you are SDA. Furthermore, I’d bet you likely grew up SDA and only continue to dabble in SDA culture, teachings and doctrine because you are comfortable with it and know nothing else. You like to snipe. Don’t be ashamed of your church’s history. The SDA church has NEVER set a date. Through progressive revelation, we have a God-given message for the world. He is coming back very soon. In the context of eternity, 170 years is a fraction of a drop in the bucket. Tell me where I am wrong (and back it up) and I’ll consider jumping. But I have looked for reasons to jump before and couldn’t find them… Pretty comfortable in my seat. In fact, I’ll invite you to come along. It’ll be bumpy but the destination is worth it. LOL. NOW CATCH YOUR BOURBON BREATH. The real “disappointment” in Carson is that his campaign people do not observe the Sabbath. They continue the robo calls on Sabbath, unlike the former Senator Lieberman from Connecticut who would not do this stuff on the Sabbath. Most SDA’s ain’t gonna vote for Carson if he were nominated! Woe is me!! YOU WOULD HAVE FIT RIGHT IN WITH THE WITH THE ZEALOUS PHARISEES AND OTHER FANATIC JEWS WHO HATED JESUS FOR BRAKING THE PRECIOUS SABBATH LAWS. WOE IS YOU. WHO “OBSERVES” AND “KEEPS” THE SABBATH TO THE LETTER? ANYONE? GIVE ME EXAMPLES OF HOW YOU STAY HOME TO AVOID WORK: WEBSTER: exertion or effort directed to produce or accomplish something; labor; toil. YOU CANT. WE OFTEN MISTAKE “WORK” STRICTLY FOR EMPLOYMENT, WHEN REALLY IF YOU ARE A JEW LIKE ME, YOU GO DEEPER. WORK AS IN THE DEFINITION ABOVE. LOL. YOUR A FUNNY LITTLE MAN RABBI RICK. DONT YOU HAVE A CIRCUMCISION TO ATTEND OR SOMETHING? IN GENESIS IT IS WRITTEN: HUMAN MALES HAD TO BE CIRCUMCISED AND ACCEPT GOD AS THEIR ONLY GOD TO BE ACCEPTED INTO HIS COVENANT. SOME OF YOU ARE OUT AS PER THIS AGREEMENT. This practice was first introduced through abraham ( Gen 17: 10).It means that for over 2,000 years no human male was required to be circumcised to be accepted of God.SO ADAM,ENOCH AND NOAH WERE A PART OF THAT GROUP. ACCORDING TO GENESIS 17:10 IT WAS FOR ABRAHAM AND HIS SEED SO WHAT PROVISION WAS MADE FOR THOSE WHO ARE NOT OF ABRAHAMS’ SEED? EXACTLY. AND FOR THE SAME INITIAL 2000+ YEARS, SABBATH WAS NOT AN ISSUE EITHER. YOU EITHER LIVED A LIFE WORTHY OF FINDING FAVOR IN GODS EYE, OR YOU DIDNT. NOAH FOUND FAVOR IN GOD’S EYE (NOTHING NOTED ABOUT SABBATH KEEPING AS THE KEY TO SALVATION FROM THE FLOOD) AND BECAUSE OF THAT, HE AND HIS IMMEDIATE FAMILY WERE THE ONLY ONES GOD WANTED TO SAVE FROM THE FLOOD, EVERYONE ELSE WAS CONDEMNED TO DIE. THERE WAS NO MENTION OF EVEN THE WORD CIRCUMCISION IN ANY VERSE PRIOR TO GEN.17:10. ON THE OTHER HAND THE SABBATH WAS FIRST MENTIONED IN THE 33 AND 34 VERSE OF THE BIBLE. GOD FINISHED THE WORK OF CREATION THAT WEEK ,RESTED ON,BLESSED AND SANCTIFIED THE ONLY DAY OF THAT WEEK THAT WAS ASSIGNED A NAME.THAT SEVENTH DAY REMAIN WITH THE SAME NAME THROUGH THE ENTIRE BIBLE. BY THE WEIGHT OF THOSE EVIDENCES THE SABBATH OBSERVANCE IS IN A DIFFERENT CATEGORY FROM THE CIRCUMCISION GIVEN TO ABRAHAM AND HIS MALE DESCENDANTS. BUT CURIOUS HOW GOD DOES NOT MANDATE ALL THESE GENERATIONS OF PEOPLE IN GENESIS (NOAH, ABRAHAM, JACOB, JOSEPH ETC) ON “SABBATH KEEPING” AS WE KNOW IT NOW. I’M SURE THEY ALL “REMEMBERED” THE SABBATH. IN ALL THE TOILS OF ABRAHAM, JACOB, JOSEPH FOR EXAMPLE, SABBATH NEVER WAS ENOUGH OF AN ISSUE SO AS TO BE NOTED IN THE BIBLE. SO FAR I HAVE NOT READ ANYTHING WHERE JESUS HE DID ANYTHING TO LESSEN THE OBLIGATION TO KEEP THE SABBATH HOLY.HE KEPT IT AS HIS MANNER WAS. After creation, God rested and hallowed the 7th day (Sabbath… Which means literally “rest”). You’d agree with that, right? Hallowed means “set aside”. So did God “set aside” this day only once? Then take a break of a few thousand years by NOT setting it aside? Then reinstitute it “just for Israel”? Does that sound logical? Furthermore, the Bible implies that Sabbath was observed, or meant to be observed, before the Ten Commandments were even given. When Moses returned to request Pharoah to set his people free, Moses requested that the Israelites be given three days to go out into the desert to worship. Could this have been a Friday-Sunday affair? Travel on Friday before sundown, worship on Sabbath, then return on Sunday? The Bible doesn’t say the days, but clearly God demands we set apart time to worship Him. When God sent manna to the Israelites in the desert He commanded that the gather additional on Friday so His people could rest on the 7th day. The 10 Commandmemts were given later. Lastly, the Bible says we will celebrate Sabbath in heaven. Clearly, God has set apart time for His creation to rest and worship Him. To say Sabbath was only for Israel is not scriptural. It was definitely for Adam and Eve, and pre-10 commandment Israel (as demonstrated from the rules for gathering manna). Let’s face it, humanity was meant to keep Sabbath from the beginning. It likely was not mentioned between the Garden of Even and manna as it was “common knowledge” and didn’t need to be addressed scripturally. Noah probably did keep the Sabbath. God’s law that He gave to Moses is a reflection of His government and law in heaven. That is why we must be followers and respect “God’s way” both in heaven and on earth. That is why, when we break His law, we must repent and claim Jesus sinless blood to reconcile ourselves to His universal law. (We cannot do it ourselves). Just because we are sinful in our human nature does not excuse us from our responsibility to seek to follow His commands. We are judged on the light we are given. Furthmore, the fruits you produce (which include attempting to adhere to God’s law) are a testament to your relationship with God. Clearly you have been shown “the light” regarding Sabbath and it’s keeping. “If you love Me, keep My commandments”. THE SABBATH BECAME A BIG, BIG ISSUE WITH THE JEWS OF JESUS DAY AND HOW HE SEEMED TO HAVE LITTLE REGARD FOR IT SOMETIMES, IN THEIR VIEW. JESUS OF COURSE HAD BIG REGARD FOR THE SABBATH, BUT WAS CAREFUL NOT TO ELEVATE THE “SABBATH” TO “GOD” STATUS. PAUL NAILED IT, READ. The “handwriting of ordinances” was nailed to the cross, I agree. And that is the laws written on paper, using man (Moses) that was nailed. NOT the stone Ten Commandments written by the finger of God. (Good luck nailing stone to a cross). The only law that is “in the ark” is the 10 Commandments. The Bible clearly states that there is a heavenly sanctuary (the original from which the earthly sanctuary was modeled). Thus, the 10 commandments are “in the ark” in heaven. The handwritten ones on paper (mosianic) were done away with with Christ’s sacrifice. God’s universal law governs not just the Jews, but the entire universe. It existed before the creation of this earth. I appreciate you tasking me with “reading it”, but I challenge you to reread it yourself. You have fallen for the most consistent, erroneous argument misled Cheistians fall for regarding the “doing away with the law”. AS TO THE “HANDWRITING OF ORDINANCES THAT WERE NAILED TO THE CROSS’ 1] WAS THERE A WRITTEN RECORD IN ANY OF THE FOUR GOSPELS OF SUCH A DOCUMENT BEEN PHYSICAL NAILED ON THE VERTICAL POLE?2]WHERE WAS THAT DOCUMENT TAKEN FROM? 3]WHO NAILED IT TO THE VERTICAL POLE?4]WHAT WERE THOSE ORDINANCES? TRUE AND SO WE KEEP THE PASSOVER AS IS MANDATED, WHY DO SDA NOT KEEP THAT SABBATH? There is multiple “sabbaths” and “feasts” given specifically to the Jews. Which one(s) is/are part of the Decalogue? Only one. The weekly 7th day Sabbath. The one that states “Remember…”. That’s because it wasn’t given to the Jews alone. It was given to the whole creation, starting with Adam and Eve BEFORE THE THE FALL. the weekly Sabbath is to be celebrated/kept before sin AND after sin AND even after sin is eradicated with the destruction of the wicked (i.e. Sabbath will be kept and celebrated in heaven). Clearly, the 7th day Sabbath differs from the others you recference. SO BASED ON YOUR RESPONSE IT WAS PAUL, WHO WAS NOT ONE OF THE TWELVE NOR JESUS HIMSELF THAT ‘NAILED IT’. TO DATE I SEE NO RECORD IN THE FOUR GOSPELS OF ANY SUCH DOCUMENT NAILED TO THE CROSS. From your question it is not clear what your definition of “Gentile” is. My understanding is that those Gentiles that accept Christ’s sacrifice are now part of Spiritual Israel (they are grafted onto to the Root (Christ)) So technically, those former non-believers are part of the New Covenant Israel (they are no longer “Gentiles”). Remember, Sabbath wasn’t given exclusively to the Jews. It was given to Adam and Eve first (importantly, BEFORE THEY SINNED). Are you saying Adam and Eve did not follow God’s newly established, hallowed, Sabbath? Prove to me that God did NOT establish Sabbath prior to sin. Prove to me God DID NOT intend Adam and Eve to enjoy His Sabbath rest. The burden of proof really is on you to PROVE THAT ONLY ISREAL WAS GIVEN THE SABBATH. ACCORDING TO THE BOOK OF GENESIS THE SABBATH WAS IN OPERATION LONG BEFORE THE CHILDREN OF ISRAEL CAME INTO EXISTENCE.BASED ON THE FOURTH COMMANDMENT GIVEN IN EXODUS 20,THEY WERE TOLD TO REMEMBER TO KEEP THE SABBATH HOLY’. THE WORD ‘REMEMBER’ SEEMS TO IMPLY THAT THEY NEW ABOUT IT BEFORE.ONE THING IS MOST CERTAIN IS THAT ON THAT FIRST PRESENTATION IT DID NOT SAY, ‘KEEP THE SABBATH HOLY’ BUT ‘REMEMBER TO KEEP THE SABBATH HOLY’. “PAUL NAILED IT” MEANING HE IS A TRUE POST CHRIST DEATH/RESURRECTION CHRISTIAN. ABLE TO DISCERN WHAT THE SACRIFICE WAS AND IS FOR AND HOW THE YOLK OF THE JEWS AND THE ANCIENT COVENANT IS NOT FOR THE GENTILES. IN THE PHOTO, YOU CAN SEE THAT DR BEN HAS BEEN WORKING THE APPROPRIATE HAND SIGNALS AND GESTURES. THERE ARE WORSE HAND SIGNALS THAN THAT.